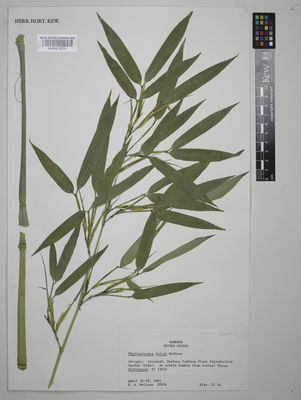 Genus: Phyllostachys Siebold & Zucc. This species is accepted, and its native range is China (Fujian, Jiangsu, Zhejiang). Perennial; caespitose. Rhizomes elongated; leptomorph. 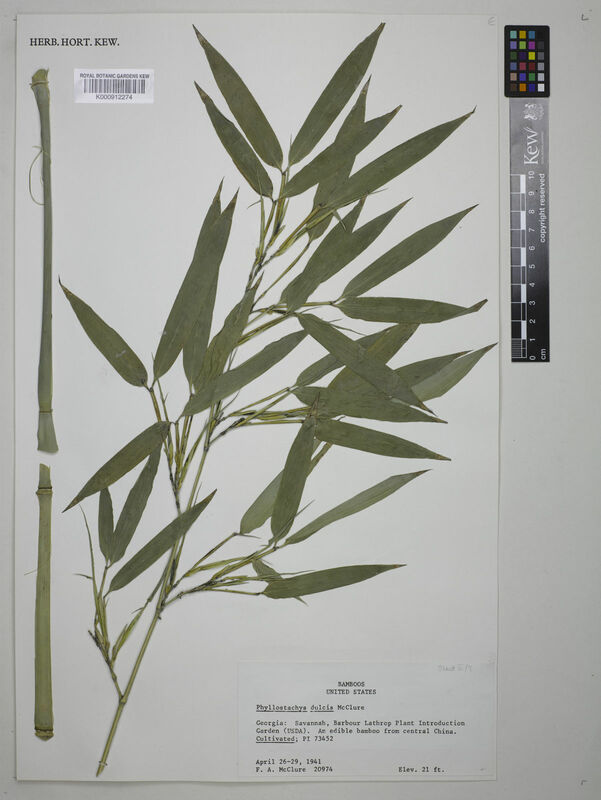 Culms erect; 1000 cm long; 57-60 mm diam. ; woody. Culm-internodes semiterete; thin-walled; 25 cm long; mid-green and white; concolorous, or striped; ridged; smooth; distally mealy. Culm-nodes bearded. Lateral branches dendroid. Branch complement two; with 1 branch dominant. Culm-sheaths deciduous; yellow and purple; distinctly mottled with last colour; glabrous; concave at apex; auriculate; setose on shoulders. Culm-sheath ligule ciliolate. Culm-sheath blade linear, or triangular; spreading, or reflexed; wrinkled. Leaves cauline; 2-3 per branch. Leaf-sheaths glabrous on surface. Leaf-sheath oral hairs scanty, or lacking. Leaf-sheath auricles absent, or falcate. Ligule an eciliate membrane, or a ciliolate membrane; obtuse. Leaf-blade base with a brief petiole-like connection to sheath; petiole glabrous. Leaf-blades lanceolate; 10 cm long; 16 mm wide. Leaf-blade surface glabrous, or pubescent; hairy abaxially. Leaf-blade margins scaberulous. Leaf-blade apex acuminate.